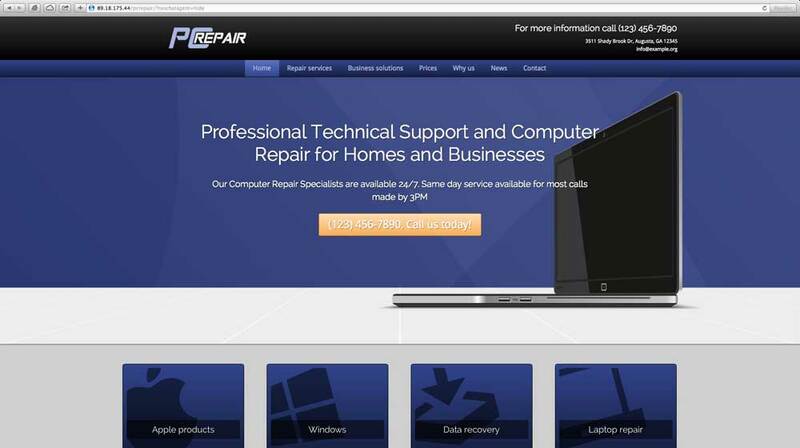 A sleek, modern website for your computer repair services can help convince potential clients of your tech-savvy, professional approach. 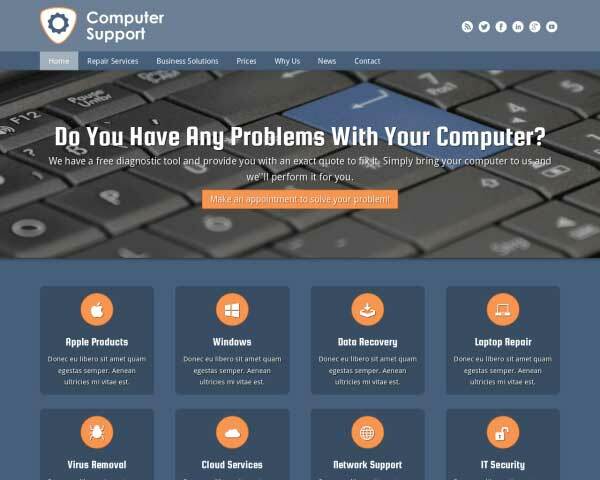 Just add your own text and photos to the PC Repair WordPress theme and it's done! It may not be obvious, but being an expert at computer repair doesn't always translate to being an expert at web design. 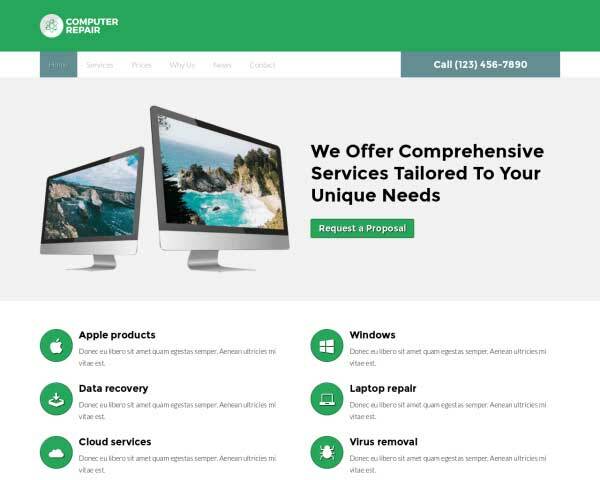 With the PC Repair WordPress theme we've made it easy to impress prospective clients with a sleek, custom website for your computer repair shop that presents your services with an appealing, modern design. This premium WordPress theme includes useful business features for PC repair technicians, such as a price quote request form, FAQ page, built-in rate charts, a news blog and a page for testimonials from happy customers. Installation takes just minutes, so your new website will be up and running in no time and already more than halfway finished. All that's left to do is upload your own photos and text to replace the placeholder content from the demo site. Customizing the color scheme and styling your content is simple and requires no coding at all thanks to our unique front-end editing tool and drag-and-drop widgets. We've even included a helpful SEO manager and seamless social media integration. So don't let a lack of time or web design skills keep you from attaining a professional online presence for your computer repair shop. Build your website with the responsive PC Repair WordPress theme and you can feel confident that this first point of contact with prospective clients matches the level of quality and competence in the services you can offer them. 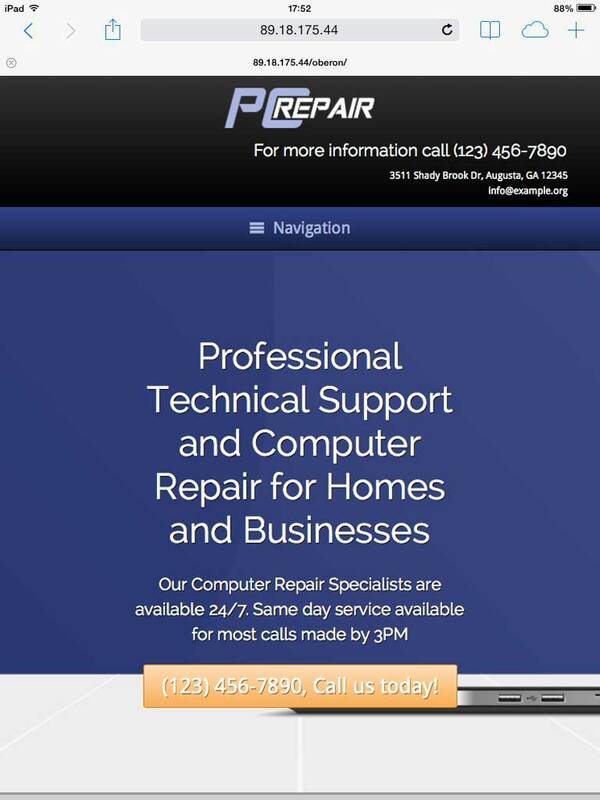 The PC Repair WordPress Theme was designed with the needs of a repair technician's website in mind. With an easy-to-navigate layout and industry-specific business features, you'll have a comprehensive overview of your services online fast! 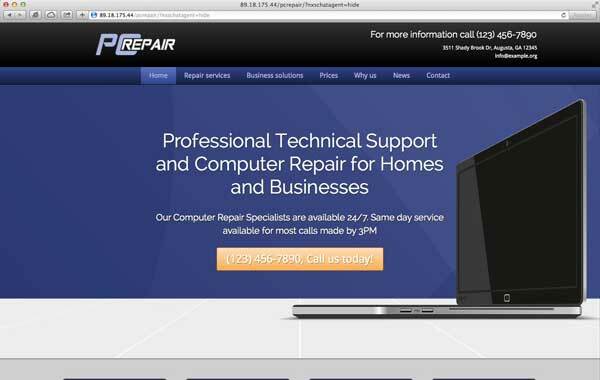 Visitors won't have to search for a way to get in touch thanks to calls to action prominently displayed on every page of the PC Repair WordPress Theme. The contact page on the PC Repair WordPress Theme includes space for your contact details plus an integrated Google map, route planner and built-in form. 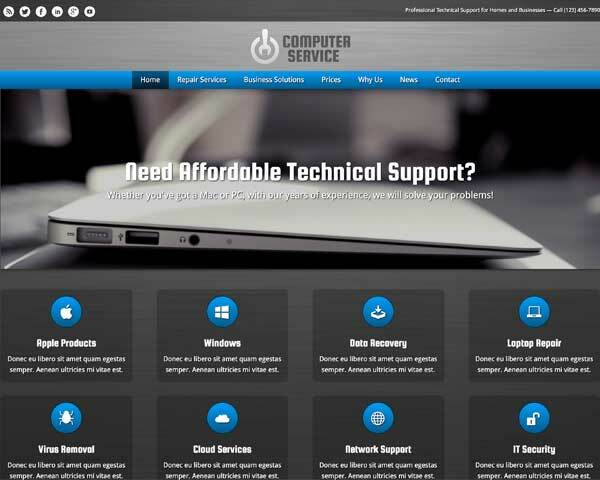 The PC Repair WordPress Theme is designed to offer visitors extensive information about your services in an attractive, organized online format. Put your customers at ease by providing answers to your most frequently asked questions, before you're asked. Simply replace the text with your own and answer away! One of the PC Repair WordPress Theme's main calls to action leads visitors of your website to a page where they can fill in an online quote request form. Easily customize the field as needed. Our rate charts make it easy to display your tech services, along with the corresponding pricing. To utilize, simply replace the text with your own. 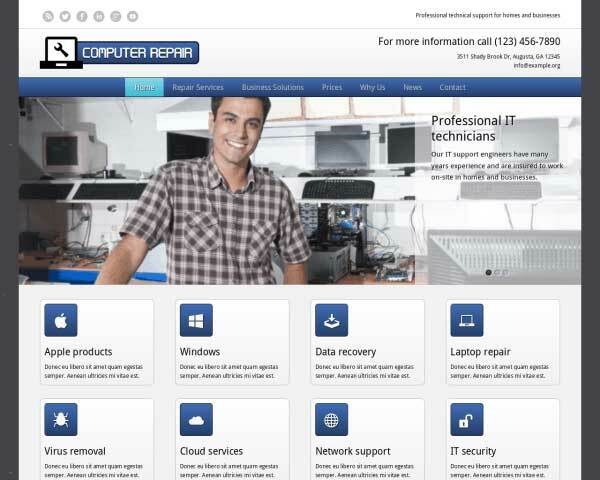 The PC Repair WordPress Theme comes pre-populated with service pages designed to suit the needs of repair technicians. Simply replace the default content and that's it! 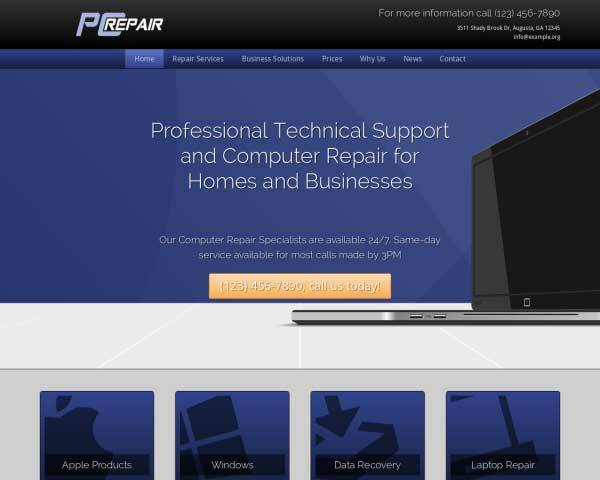 Offer an attractive overview of your services on the homepage of the PC Repair WordPress Theme, along with quick navigation to important pages on your website. Encourage visitors to follow you online with a single click. The PC Repair WordPress Theme includes matching icons as well as widgets that display your latest tweets or a Facebook like wall. 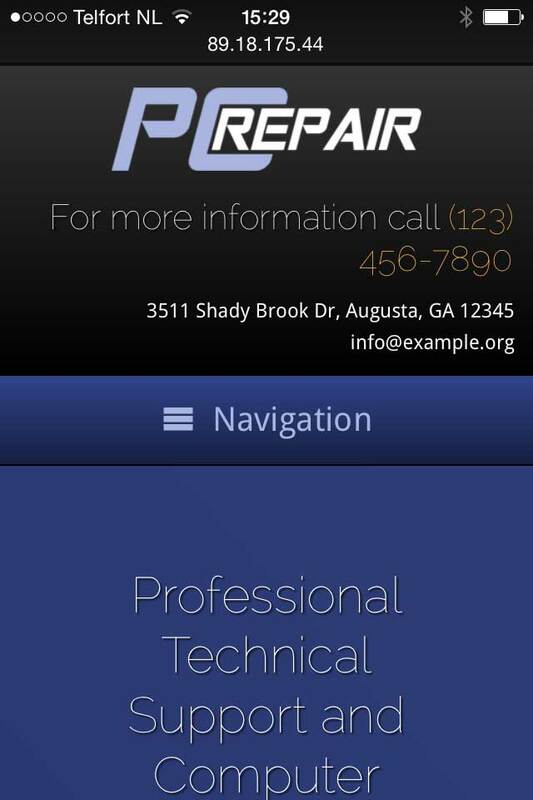 Clients will be curious to learn about your team of repair technicians before trusting you. Introduce your staff with a photo and short bio on the about page of the PC Repair WordPress Theme. An effective way to convey your authority in the tech business is to display logos from your professional associations or awards. Simple replace the icons with your own. Mobile-ready design is an ideal goal for any website, but when your business is all about technical expertise, it's especially important that your online presence makes a great impression even on handheld devices. Power up your existing website, or build a brand new one with the responsive PC Repair WordPress theme and rest assured that the mobile version of your site will offer visitors the same professional design, functionality and user-friendly navigation of the desktop version. Without any tedious coding or plugins, the layout of your content will automatically adjust to fit neatly on any screen size.